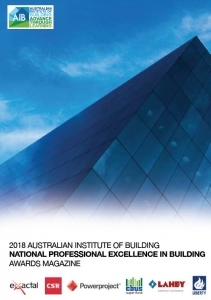 The AIB Professional Excellence in Building Awards Annual publication commemorates the achievements of outstanding individuals who have been bestowed awards at the National AIB Professional Excellence in Building Awards each year. Perhaps the AIB’s most “glamorous” publication, given its spectacular images and biography of the winning entries from the national awards. Its wide circulation through the building & construction industry includes; major construction companies, the media and other professional groups.